Things have been a bit quiet here recently, partly because I have had my mind on things other than wine. And those other things that are going to be the subject of this post. Google revealed very little information relevant to my mission to replace a BT landline by VoIP (Voice over Internet Protocol), so for the greater good I am telling my story here. If you came here looking for information about wine, normal service will be restored in my next post. My situation is that I rarely use my home BT landline, but it is still costing me the price of a decent bottle of wine per month for the line rental. However I would quite like to hang onto my existing landline number to give family and friends a cheap way of contacting me. So I wanted to explore the possibility of saving money using VoIP for the main household telephones. This was feasible for me as I use a cable modem for my broadband. My mission was to save money on line rental, but to have a good quality reliable system rather than aiming to get the cheapest possible deal. I soon became aware that this is not a common motivation; most people seem to want to save money on call rates, or to use it as part of a PBX switchboard solution. You probably also need to know a bit about me to interpret what I write below. If I say something is easy or difficult you should bear in mind that I work as a software engineer, or computer programmer if you like. I don’t have great networking skills, but usually manage to hack my way to a solution. Many VoIP providers will let you sign up free, and you can test out their services using a softphone – an application you install on your computer that lets you dial out and receive calls using the inbuilt computer speaker and mic, or an external headset. I signed up with a couple of providers: Voipfone and Sipgate. The choice was based on limited information. I had seen Voipfone mentioned a couple of times in a positive light, and they are founder members and Quality Mark Approved members of ITSPA. I wanted reliability, and all that seemed to bode well. I chose Sipgate basically because I had heard it talked about quite a lot, and because it is cheaper than Voipfone in a few respects for my requirements – Sipgate will let me use a normal geographical number for free, while Voipfone would charge £2 per month. However, you can contact Voipfone by phone or email if you need support, while Sipgate only offers email support. Also Voipfone offers more extra-cost options should you need them. There are cheaper providers than Sipgate, but I did not want to get into bargain basement territory. It took me longer than I thought it should to find a suitable free softphone and get it installed and running. That was mainly because I did not spend enough time thinking about things, and spent a lot of time trying, and often failing, to quickly set up many competing applications. I eventually settled on Voiper Classic Free, which works fine. As many people before me have said, the sound quality is a lot better with an external headset, but a softphone is perfectly usable with the inbuilt computer speaker and mic. All in all the softphone step was quite easy really. My next step was to get an ATA (Analog Telephone Adapter). Getting that bit of kit running reliably is the key to me ditching my BT line. It plugs into a cable modem and/or wireless router (I have two separate boxes) and will also allow ordinary telephones to be plugged into it. When connected via the ATA to the Internet and my VoIP providers, they would then work as normal phones connected to a BT socket. I went for a Lynksys SPA2102 as it seemed to be a popular choice and, unlike the cheaper PAP2T, could sit between the cable modem and the router, ensuring that telephone calls get priority over other Internet traffic. The first issue I encountered with the ATA was that I needed an RJ11 plug to BT socket adapter, and one with a ringing capacitor as I was using an an older style phone. But despite the fact that the ATA was packaged for the UK market, there was no mention of this in the documentation, so I spent at least one evening with the supplied RJ11 to RJ11 cable, messing with settings and trying to discover why things would not work. The problem was diagnosed by Voipfone support. Voipfone don’t seem to monitor their online forums well, which is a shame, but emails were replied to in less than an hour. Then I signed up with Sipgate. The actual account setup went smoothly, but I could not get their website to accept my credit card, and when I tried to register my address for 999 calls the website denied all knowledge that Manchester was a city. An email to support got a reply some 12 hours later, and both problems were fixed at their end. Since then I have never needed to use Sipgate support, and configuring the second line on my ATA to use Sipgate went smoothly with my prior experience. With two lines now working, I turned my attention to the strange dial tone I was getting on the Voipfone line. That was another evening of googling and messing with ATA settings, but it turned out that Voipfone were overriding the dial tone I had configured, to tell me that I had voicemail. So then the two lines were working to my satisfaction, and I took a sigh of relief. But later I was made aware that the SPA2012, which sat between my cable modem and wireless router, gave the router only 7.5Mbit of bandwidth – something else not mentioned in any documentation that came with the box. So then I spent another happy couple of evenings or so reconfiguring the ATA so it would sit behind the router and not throttle my bandwidth. The tricky bit was to make it reachable from my computer via the wireless network, so I could configure is conveniently in the future. I also needed to figure out the most sensible way of configuring my router to give the ATA priority over other traffic. It took so long because my networking skills let me down, but I got there in the end. Here is my current setup. From top to bottom, there are the leads from telephones for Voipfone and Sipgate, the ethernet cable from my router, and the power lead. The top two lights indicate the status of the two phone lines. Labels help me keep track of which line is which! The last issue I noticed was to do with the way registrations are dealt with by my two VoIP service providers. In order for either the ATA or softphone to make and receive phone calls, it needs to register with the providers server. This is an issue with Voipfone because, without paying more money, only one device can be registered at a time. That means that a softphone and the ATA well sometimes fight to get the registration. For my configuration, it is the softphone that loses out, meaning it might not ring even if you think it is registered. Sipgate however allows multiple registrations on the same account, so all registered devices work as you might expect at all times. There are hundreds of settings on the SPA2102, and altogether I probably spent about a week of my free time messing with them. If you are a technophobe, you really do not want to go there. Even if you are a techie, beyond the basic setup, the information you need is complex and difficult to find. The bible is Administration Guide – Cisco Small Business – SPA2102, SPA3102, SPA8000, SPA8800, PAP2T – Analog Telephone Adaptors, but you have to work that out for yourself with the help of Google – not that it is much help for mere mortals. You are more likely to find suitable help in one or more of the many unofficial guides to setting up ATAs, but they often contain small errors, are inconsistent, and may not be for the precise ATA model you have. My overall impression is that it is a bit of a black art, and very few people seem really to understand everything. Those that do presumably earn a good living as consultants. All this is not helped by the fact that there is no official way of saving settings so you can experiment without fear of permanently cocking things up. But somewhere on the interweb I found that you can simply save the settings as a .mht file from your browser, and reload them by opening the file and clicking Save. Seems to work, but who knows for sure? The devices are really designed for remote provisioning – someone else does the work and the ATA gets the settings from a server. The various online forums can also be a great resource. Not only can you gain knowledge by reading existing threads, but you can also directly ask question. In particular I found the newsgroup uk.telecom.voip helpful, and I would like to thank people for taking the time to help me in a couple of threads there. Some VoIP providers will provide help with ATAs. If I had paid a premium for my ATA and bought it from Voipfone, it would have come preconfigured, and with the RJ11 to BT adapter included. And for a price, companies like Vonage seem to provide more of a packaged solution. But personally speaking I want to feel more in control so I can take advantage of the more open aspects of VoIP. After a few weeks into my experiment I think I made a good choices of providers for my trials, and I don’t feel tempted to widen the field. I have had only a few reliability issues over the course of a few weeks. 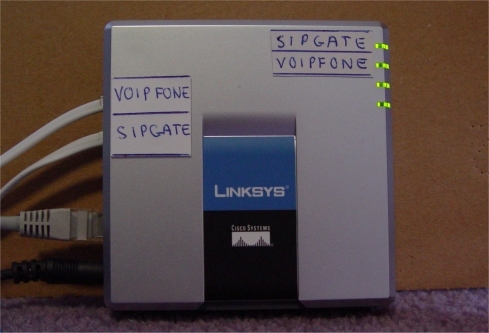 I once needed to reboot the cable modem and wireless router to get the Viopfone line on my ATA to work once – the Sipgate line was fine at the time. The Sipgate sound quality was impossibly lumpy on one call, and on one Voipfone call the person at the other end could not hear anything at all. But otherwise, sound quality with both providers has been as good as the BT line. Which producer would I move my BT number to? I am still not sure, but I think Sipgate is in the lead as it will be a bit cheaper, and allows multiple registrations. But Voipfone is attractive because of the more responsive customer support. What I like about both companies it that they are straightforward to deal with, and have a clear charging structure. The complexity of BT’s charging structure is truly staggering, and I remember bad experiences of negotiating my way through their call centres. I am still not sure if I will eventually take the plunge and ditch BT, but in the meantime I have a couple of extra phone lines into our house, and a couple more opportunities to find a good call rate. This entry was posted in Non wine related. Bookmark the permalink. This is just what I plan to do ! Think i will go with Sipgate, will let you know how i get on, just need to order a suitable ata now. Thanks for the insight, I am at the point of porting a BT Broaband Voice number out to a VOIP provider. Mainly beacuse I cannot keep the BBV service if I switch to BT Infinity product. My requirement is much less than yours in that I just want to preserve the number and do call-forward to a mobile. I may well give sipgate a go now that I have read your positive experience and I have the BT info I require. Great article, thanks! I have been through the same situation (testing an ATA and mobile SIP phone). I chose to go with Sipgate due to the multiple registrations, however am now being advised they no longer accept number port requests for residential users. You must buy the £15 a month Sipgate Team business service. I have therefore gone with Voipfone, and if I know I am away for an extended period I turn off my home ATA before logging in my iphone SIP phone. Hi, I need to move my BT no to any free or cheap SIP provider. I use this no for incoming calls. It is not true that “In UK everyone firstly have to pay a monthly landline connect to access internet”. You can use a cable modem, and if you had bothered to read my post you would have realised that is what I do. As for the rest of your comment, I have no idea what you are on about or what relevance it has. Steve, I’m so encouraged, having read your post, to look at VOIP more seriously. I have cable broadband and phone. The phone is seldom used and the thought of paying £17 a month for phone rental is ridiculous. Until I read your post I had only seen voipfone and even then I thought £2 a month is a clear winner vs £17. I’d be interested to know if you’ve stuck with VOIP since you first wrote your post and who you’re with. I’m impressed with all the digging around you did to get it all working but I think I’d be tempted by voipfone over SIP just for the ease of setup (I hope). Great article and thanks for taking the time to put it all down. With the VOIP setup I described, there were always occasional sound quality issues of various types. I think I somewhere read a suggestion that they might be related to the particular model of ATA. I could probably have lived with it just about, but my wife was not happy with the quality so I am just continuing to use them as additional lines that may be a bit cheaper for outgoing calls. However, I am also now using the Voiper smartphone app, and both accounts seem to work well there. It’s also a heck of a lot easier than configuring an ATA. That might be a solution you would like to consider. Steve – thanks for putting this up on the web. I know it is a relatively old story now, but seems to be one of the few out there where residential customers are looking for a VOIP/SIP solution. I’m also considering such a move away from BT, largely thanks to the fact that despite living in central London, the likelihood of ever getting fibre is remote (BT even has recommended applying for funding for rural broadband fund to get fibre). Thankfully Virgin is around here, but my previous experience with them back in the NTL days is not for repeating on the web. The short story is that I ideally will move to Virgin, but only take their cable internet product. Unfortunately we still get lots of family from the UK, France, US, Virgin Islands and Australia calling us, and none of them want to (understandably) call our mobiles. I’m therefore looking for a SIP/VOIP solution and have my number ported over. To make matters a little more complex, in an ideal world we would love to ditch all our physical phones and move to a softphone solution where we use our smart phones (iPhones) to both answer and make calls. The problem is that I can’t see to see a single provider who does everything. Sipgate seem poised to re-enter the residential market and are cheap from the perspective of being able to migrate a number over to them. Voipfone seem to be the more professional of the groups, but with a price to match. Also as I want to avoid having a real phone, I would need to register various devices with them which may trigger various fees with Voipfone. My other option would be to use Asterix and route everything via my Synology NAS, however if I am travelling this would incur an extra hop and in turn likely reduce call quality when I am not at home. Minus the extra hop issue, that would allow possible use of DIDLogic who seem to offer some very impressive call rates, but I don’t believe I can port a number over to them. Thanks for your comments Aims, but I don’t think I can help much beyond what I have already said already – in the post and comments. It seems you might already know this, but after a few quick checks it seems that Sipgate lets you register multiple devices without extra charge, and they all ring when you get an incoming call, which is probably what you want. Do double-check though – I am not relying on that feature. Originbroadband however offer broadband only for ASDL… and they allow VOIP traffic. It’s possible worth looking at porting your landline number to VoxBeam and either use their VOIP services as is, with the assistance of a phone at home with voicemail capabilities, or just use VoxBeam to forward calls to another VOIP provider.. Localphone would be a good choice (same company as voxbeam, but have things like voicemail). You could then configure your ATA to allow incoming calls to localphone and route outgoing calls via voxbeam to take advantage of the lower call rates. For what it’s worth, I’m in the sticks and am using Vispa internet to get a 60Mbs via a wireless connection, hence I don’t need my BT landline anymore. I’ve currently gone down the SipGate route but I was worried about the comment that someone made about them not porting over residential numbers…. Great articles details of porting would be appreciated. Hope the settop is all running well. Will be joining Sipgate in about a month’s time. Just wanted to know though, Do I think I can get away without Voip ATA with sipgate if I just invest in voip capable phones without the additional expense of ATA adapters? Are there any immediate not so obvious disadvantages to this route? No big disadvantages that I know of, but I have not done this myself. Possibly more expensive, especially if you already have normal phones as I did. I started to look at the cisco SPA122 at appx £55 , and came across a Cisco SPA301s @appx £35 + my current phones are nothing fancy with no phonebook or anything primarily incoming use as we are heavy on mobile use. Might use more heavily outgoing once VOIP though. Just got a bit thrown off as wasn’t sure if an ATA was a must have if you needed 2 different providers like your VOIP/Sipgate setup, which is something I would like to look into doing. Just might to get an ATA after all if I cannot swap the alarm to a gsm system. I now understand how each step leads to yet another question. I will now complete a registration, as just found out via that uk voip group you’d mentioned, that private use doesn’t need with sipgate doesn’t have a monthly cost attached to it to keep the free local number and any subsequent ports from other providers, except the one-off port cost. Not really sure what your needs are, satyp, but another option is to use a smartphone app. I found I got on well with Voiper. It doesn’t hurt to try it, possibly in addition to “proper” phones. Awesome cheers Steve, as needs appear to be constantly changing at the moment.. I just discovered your article whilst search for voip information and interestingly enough I am planning to do exactly what you have achieved for exactly the same reasons. Your story will no doubt help to be a blue-print for my own experimentation to come. I had already fired off questions to voipfone and have several phone to voip converters that I am watching on flea-bay. Again the similarities do not end there, 30 plus years in IT myself, it makes me wonder why it’s taken me till now to get around to this. Anyway a brilliant insight into your voip project and may I say ‘thank you’ for sharing the experience.